After Falling 70%, Is FireEye Inc A Buy? Is this beaten-down cybersecurity firm a rebound play or a falling knife? Shares of FireEye (NASDAQ:FEYE) have plunged nearly 70% over the past 12 months due to the cybersecurity firm's slowing sales growth, rising competition, cash burn rate, and executive shakeup. FireEye recently bounced on news that it rejected several buyout offers, but that momentum has since faded. However, FireEye now trades at almost a 20% discount to its IPO price of $20. Should contrarian investors take a closer look at this stock as a rebound play, or is it just a falling knife? FireEye helps 4,700 customers in 70 countries counter attacks with threat detection services. FireEye's services are widely considered the "best in breed," and it was the first cybersecurity company to be certified by the U.S. Department of Homeland Security. Personal data breaches nearly doubled to almost 178 million last year, according to the Identity Theft Resource Center, which indicates that demand for threat prevention solutions should keep climbing. However, competition in that market is also rising. Over the past few years, Cisco (NASDAQ:CSCO) acquired several cybersecurity firms and bundled their security services with its market-dominating networking hardware. Next-gen firewall maker Palo Alto Networks (NYSE:PANW) also offers competing threat prevention services. That competition, coupled with a slowdown in enterprise spending, caused FireEye's sales to only rise 34% annually to $168 million last quarter, missing estimates by almost $4 million. That was down sharply from 70% growth in the prior year quarter, due to a higher mix of recurring product subscriptions, which are recognized over longer periods. Billings rose 23% annually to $186 million, which beat estimates by nearly $10 million thanks to the growth of its cloud-based threat prevention, email protection, and FireEye as a Service (FaaS) platform. But that figure still compared poorly to 53% growth a year earlier. FireEye's guidance for 21% to 26% sales growth for the current quarter missed expectations for 31% growth, and its forecast for 25% to 30% growth for the full year also missed analyst estimates of 33%. Like many of its industry peers, FireEye isn't profitable. Its GAAP net loss widened last quarter, though its non-GAAP net loss narrowed by a penny to $0.47 per share, which topped expectations by three cents. FireEye finished last quarter with a negative operating cash flow of $22.5 million, compared to negative $3.2 million a year earlier. Its cash and equivalents also plunged 56% sequentially to $175 million, due to its planned acquisitions of iSIGHT and Invotas. That cash burn rate is alarming, since FireEye already issued a secondary stock offering and a convertible debt offering to raise cash within its first two years as a public company. To make matters worse, FireEye's executive shakeup has rattled investors. Last July, CFO Michael Sheridan, who had been with FireEye since 2011, abruptly resigned. Last quarter, CEO Dave DeWalt, the former McAfee CEO who had led the company since 2012, also announced his resignation. He was replaced by President Kevin Mandia, the founder of Mandiant, which FireEye acquired back in 2014. Amid all those headwinds, FireEye has a few potential catalysts. First, FireEye is gradually pivoting away from on-site and cloud-based appliances toward FaaS, which would reduce its dependence on product revenue (which fell 16% annually to $33.7 million last quarter) and bolster its services and subscriptions revenue (which rose 58% to $134.3 million). FireEye expects stand-alone product subscriptions, which include FaaS, to account for 35% of its top line this year, compared to 26% in 2015. Second, FireEye is still a lucrative buyout target for any larger company looking to consolidate the fragmented cybersecurity market. FireEye's reputation and its long list of partnerships -- which includes deals with Hewlett-Packard Enterprise, Check Point Software, F5 Networks, and Visa -- would be a valuable addition to a larger company's security portfolio. Its enterprise value of $2.5 billion makes it a pretty small purchase (even with an acquisition premium added) for rumored suitors like Cisco. Lastly, FireEye isn't expensive by cybersecurity industry standards at 4 times sales. Palo Alto trades at 9 times sales, and privileged accounts management leader CyberArk (NASDAQ:CYBR) has a P/S ratio of 8. This indicates that the stock might rebound very quickly if its shift toward FaaS pays off. FireEye isn't a stock for queasy investors, and it definitely shouldn't be a core holding in their portfolios. 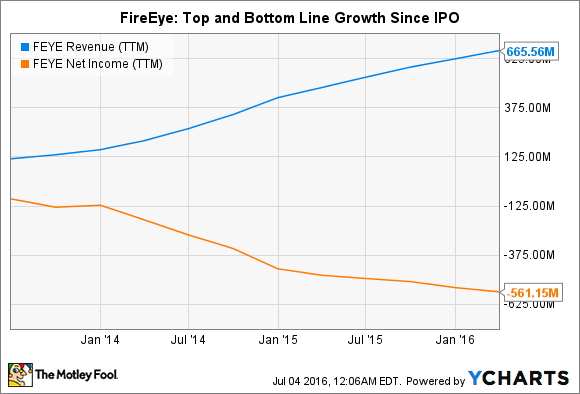 But for investors with a stomach for volatility, FireEye could produce impressive gains as its sales growth stabilizes or it gets acquired. I'm not convinced that a rebound will happen anytime soon, but I also don't think that it's a falling knife to be avoided.